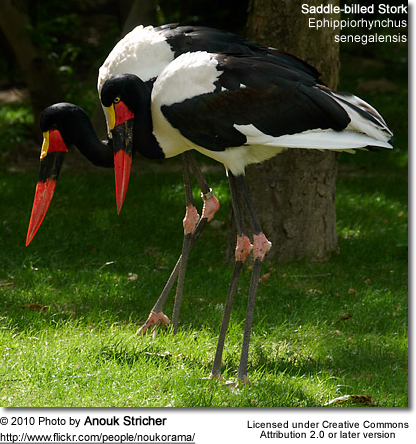 The Saddle-billed Stork (Ephippiorhynchus senegalensis) is a large wading bird in the stork family, Ciconiidae. It is a widespread species which is a resident breeder in sub-Saharan Africa from Sudan, Ethiopia and Kenya south to South Africa, and in The Gambia, Senegal, Côte d'Ivoire and Chad in west Africa. This is a close relative of the widespread Asian Black-necked Stork, the only other member of the genus Ephippiorhynchus. This is a huge bird that regularly attains a height of 150 cm (5 feet) and a 270cm (9 feet) wingspan. The male is larger and heavier than the female, with a range of 5.1-7.5 kg, the female is usually between 5 and 6.9 kg. 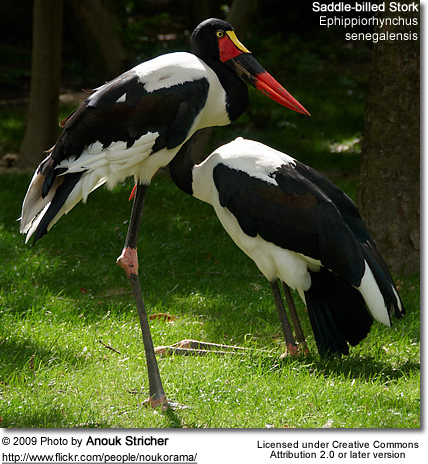 It is probably the tallest, if not the heaviest, of the storks. Females are distinctly smaller than the males. It is spectacularly plumaged. The head, neck, back, wings, and tail are iridescent black, with the rest of the body and the primary flight feathers being white. The massive bill is red with a black band and a yellow frontal shield (the “saddle”). The legs and feet are black with pink knees. Sexes are identically plumaged except that the female has a golden yellow iris, while the male's is brown. Juveniles are browner grey in plumage. They are silent except for bill-clattering at the nest. 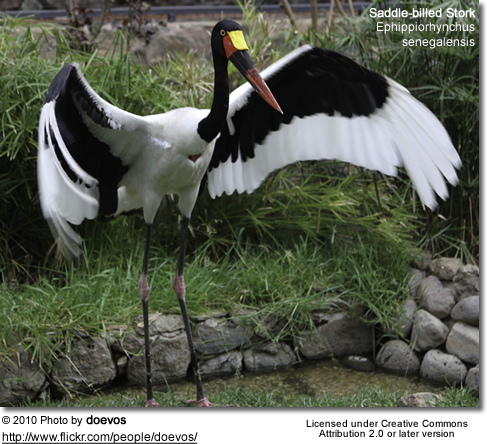 Like most storks, these fly with the neck outstretched, not retracted like a heron; in flight, the large heavy bill is kept drooping somewhat below belly height, giving these birds a very unusual appearance to those who see them for the first time. To experienced birdwatchers on the other hand, this makes them easily recognizable even if seen from a distance. It has been suggested that due to the large size and unusual appearance in flight, this species is the basis for the "Big Bird" and Kongamato cryptids. 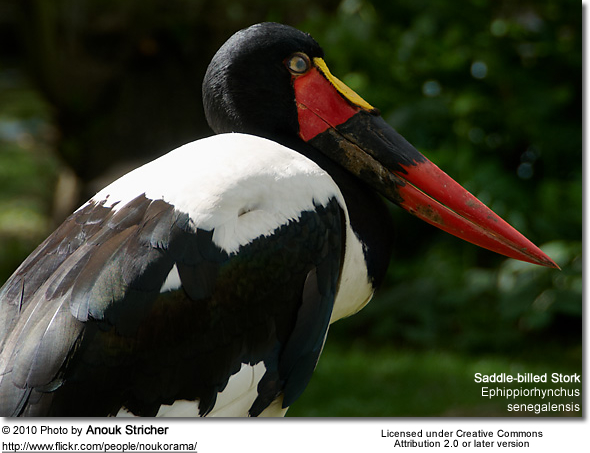 The Saddle-billed Stork, like most of its relatives, feeds mainly on fish, frogs and crabs, but also on small birds and small reptiles. They move in a deliberate and stately manner as they hunt, in a similar way to the larger herons. 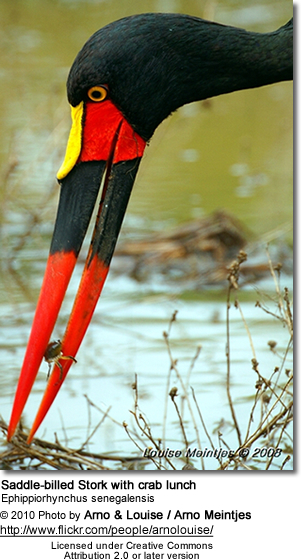 Its description is often erroneously given as "jabiru", which is actually this species' Latin American relative. The Third Dynasty pharaoh Khaba incorporated this hieroglyph in his name (Jiménez Serrano 2002). BirdLife International (2008). Ephippiorhynchus senegalensis. In: IUCN 2008. IUCN Red List of Threatened Species. Downloaded on 3 February 2009. Database entry includes justification for why this species is of least concern.